Looks like the Mac has a posse, Microsoft Office in the above ad from Apple UK. Microsoft has been building Office for the mac for around 5 years now, and it’s no secret that the mac version just looks cooler. Although, I do like Office 2007 for the PC, but Office 2008 for the Mac is Micrsoft’s latest hotness from what I’ve seen heard 😉 . I placed my order this morning for the new BlackBerry 8800 from T-Mobile. I’m trading my BlackBerry Pearl for a Sidekick 3 from a friend. Now that I placed the order, I saw that the price is $349 ($373 with tax + free shipping) with instant rebate. CRAP! I paid $518 with express shipping and tax. I was planning on getting a 2nd line from T-Mobile anyway for the Sidekick 3.So, I’m going to call them up when I get the 8800 in, and ask to open a 2nd line. I will tell them I would like to also purchase the 8800 at the time, yet they don’t have to send me one since I “already bought one.” In a small company, this wouldn’t be a problem, they would just say keep the other one and that’s it. We aren’t talking about a small company here. Logically I should just keep the phone, yet pay the $349 price. Logistically, because of the serial number and since it is “on a different line on the same account” I doubt that T-Mobile will be able to pull it off. Props to them if they can, but I don’t see it happening. 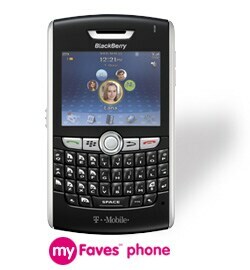 Operating on T-Mobile’s EDGE network, the quad-band BlackBerry 8800 offers T-Mobile’s myFaves(i) experience to easily stay in touch with those who matter most, and incorporates built-in GPS (Global Positioning System) to support location-based applications. BlackBerry Maps is included, which provides on-screen driving directions with the ability to track the route via the GPS, and also makes it easy for customers to generate a map directly from their BlackBerry Address Book. T-Mobile’s site has no mention of GPS at all. The Pearl from T-Mobile also doesn’t contain GPS, while the Cingular/AT&T version does. Whose fault is the typo? I was looking forward to GPS on the 8800, and didn’t purchase the Cingular/AT&T version (with GPS), because I didn’t want to switch companies yet. When I get the 8800, I’ll report back on the exchange process, and if it has GPS. Here’s hoping everything works out smoothly. Were you left stranded the day the BlackBerry died? Miss that important email that lost you thousands of dollars? Well AT&T has something for you, $2.50. Yep that’s right, AT&T is crediting any user who calls in and requests credit for the downtime with a cool $2.50. You can maybe even buy a small tall coffee at Starbucks for that much, wait nope. How about a Big Mac, nope. Well we’re sure you will find some way to spend that $2.50, that is if you want to take the time out of your busy today and wait on hold for $2.50. I didn’t even know it was Earth Day, until I say the Google Doodle. Maybe I should go buy another PET (petroleum-based plastic) bottle of Voss or something, I heard that PET plastic is good for the enviroment or something like that. The new link is Google.com/Products, although Froogle.com redirects to the new page. RIP Froogle. How Many Cell Phones Does One Need? I’m a big cell phone user, but I don’t make many calls at all. I use cell phones for the features that go beyond making calls. Of course I am planning on getting an iPhone once it launches in June, but I’m sick of my BlackBerry Pearl. Mainly, I hate the SureType keyboard on it. Next Tuesday, T-Mobile is launching the BlackBerry 8800 with GPS and a full QWERTY keyboard. I’m switching to that for sure. The Sidekick ID, a slimmed down version of the Sidekick 3 comes out Wednesday.A BlackBerry is great for email, but I’ve always preferred to SMS and IM through the Sidekick. With the Sidekick ID coming out next weeks, it seems like a cheap way to get back into the Sidekick world of IM’ing. The Sidekick service by itself runs $30/month. BlackBerry service from T-Mobile also runs $30/month with no voice plan. I’m already paying $60/month for 1,000 minutes and unlimited BlackBerry usage on my Pearl. I am also testing the Samsung UpStage for Sprint with unlimited usage for 6 months. I can use this phone as my primary “phone call” phone for that time. Is it worth it to have 2 data phones? I would use the BB 8800 for Google Talk, GPS, and Email, while the Sidekick ID would be for AIM, MSN, Yahoo, and SMS. I just really liked the ease of use on the Sidekick. Thoughts? Intel is set to release on April 18th a new ultra mobile platform which will provide double the battery life (up to 5 hours) and a smaller footprint. New ports will allow GPS, 3G, and DTV type devices to be added. The CPU is known as “McCaslin,” will be about 1/3 the size of previous chips. The decreased size will thus result in lower production cost. The UMPC might eventually get down to the target price range of $500 as described when it was first released. This announcement comes a mere few days after we unboxed the OQO model 2, which uses Via’s small form factor C7M. This new McCaslin is said to be Intel’s response to the C7M. Look for an official word from Intel on the 18th. UBiQUiO has launched their latest smart phone, 503G, and it squarely aimed at taking down Samsung’s BlackJack. This phone is an unlocked quad band GSM handset and which includes HSDPA, WiFi, Bluetooth, 520 MHz CPU, 2.0 megapixel front-facing conference camera, 2.4″ QVGA touchscreen, and QWERTY keyboard. Windows Mobile 6 will allow for rich HTML emails, Microsoft Office integration, increased security, and all around increased productivity. This phone will work on most cell networks, but there are none in the wing right now that are currently set to offer it directly. T-Mobile is still a ways from launching it’s 3G network which will rely on HSDPA, and at&t already has the BlackJack. Look for this phone to be sold on MobilePlanet or eXpansys around the end of June for $650. A special edition Motorola Q has been released with Amp’d Mobile today. This Q has been designed with an enhanced flash version of Amp’d Live, Custom Q User Interface, and even includeds a 256MB miniSD card. It includes all of the other bells and whistles the Q has become known for, ie. bluetooth, Windows Mobile 5, 1.3 megapixel camera, etc This is the coolest looking version of the Q out there, compared to Verizon and Sprint’s edition. It’s available today for $199. Has your iPod saved your life today? US infantryman Kevin Garrad can now say that buying an iPod was a life changing experience. After rounding a corner an insurgent fired a 7.62mm round fired from an AK-47. The iPod was enough to soften the blow to his body armor, leaving him unharmed. Truly an incredible story, and if Apple wants to capitalize on this, they would give him a new iPod. He was due for an upgrade anyway, the iPod that saved his life was a 20 gig 4th generation HP iPod.